China has dispatched warships and scrambled fighter jets to ward off US two US-guided-missile destroyers which sailed close to disputed South China Sea islands. 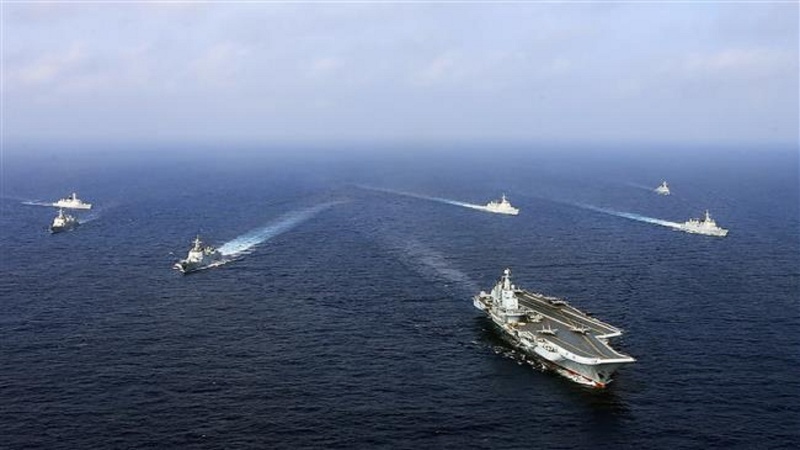 China’s Defense Ministry released a statement on Sunday, in which it announced that its ships and aircraft had been deployed to ward off the US ships which had entered the country’s territorial waters without permission. The ministry also slammed the arrival of the US warships near the islands, referring to the US’ move as a “provocation” and an infringement of China’s sovereignty. It added that the Paracel Islands were are an inherent part of China’s territory, and that Beijing resolutely opposes the US actions which go against Chinese and international laws. The statement also noted that the Chinese army is adamant to bolster naval and air combat readiness, advance defense levels, safeguard national sovereignty and security and safeguard regional peace and stability. China will keep on taking all the necessary measures to protect its sovereignty and security. The statement was released shortly after the Higgins guided-missile destroyer and the Antietam, a guided-missile cruiser, came within 12 nautical miles of the Paracel Islands on Sunday. The islands are among a string of islets, reefs and shoals over which China has territorial disputes with its neighboring countries. The military vessels conducted maneuvering operations near Tree, Lincoln, Triton and Woody islands in the Paracels. Last week, China’s Defense Ministry has voiced regret after the United States withdrew an invitation to China to attend a major US-hosted naval drill amid their dispute over the South China Sea. The Pentagon said that the move was made in the wake of “strong evidence” that Beijing had deployed anti-ship missiles, surface-to-air missile systems and electronic jammers to the Spratly Islands, claimed by several nations. China’s air force bombers landed on the disputed islands as part of the country’s war games in the region over the weekend. Beijing reiterated that its building of defense facilities was to protect the country’s legitimate rights, and had nothing to do with militarization. China has repeatedly warned the United States against sending warships to patrol the South China Sea. Washington claims such operations are meant to protect “freedom of navigation” in the sea, a gateway for trillions of dollars in maritime trade each year. China’s island-building in the South China Sea has also drawn criticism from the US, which accuses Beijing of undertaking a land reclamation program to build artificial islands, which could be used as military bases. However, Beijing, which claims almost the entire South China Sea, has denied the allegations and says any military activities on the islands have been for self-defense purposes. Washington’s military presence in the region, halfway around the world, has also led to worries about an increasing risk of accidental collisions that could spark a consequential wider conflict.